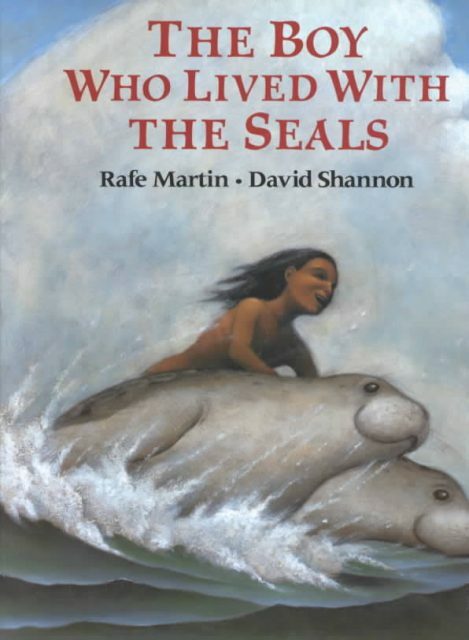 Rafe Martin’s, “The Boy who lived with the Seals” evokes powerful themes and contains breathtaking illustrations. 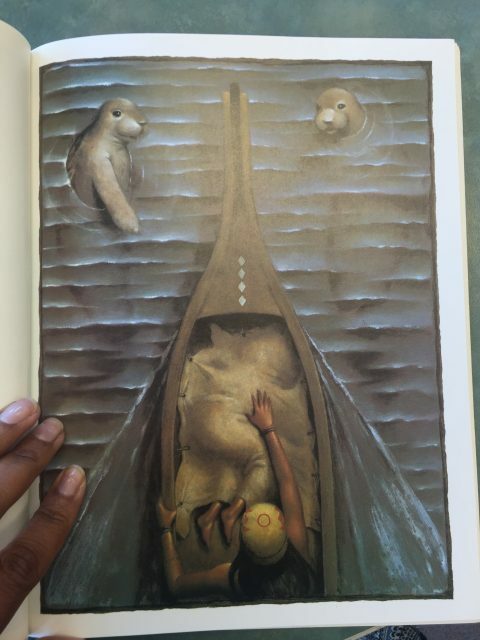 The story is about a young boy who disappears and is discovered some time later living harmoniously among the seals. In the depths of the night he is stolen and delivered to his original clan. It is clear however that he has been forever changed and does not fit into the world he once new. He shies away from other humans and spends time carving by the sea where the sounds of seals can be heard. As spring approaches, the clan travels along the sea. 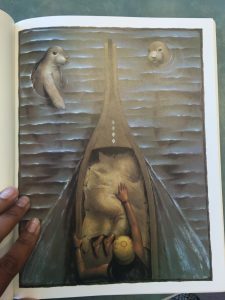 While doing so they must keep the boy tied down in the canoes so he does not jump in and return to the seals. His family is initially sad and continues to search for him, but every spring they find a new canoe carved for them, and find peace. Analyzing this book along the rubric we received, I felt it deserved the best score in each category. 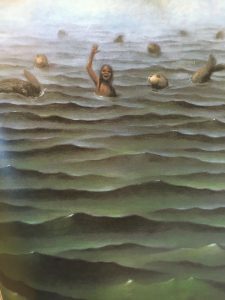 The story was well developed, the boy’s development was the main focus and the illustrations brought the setting to life. 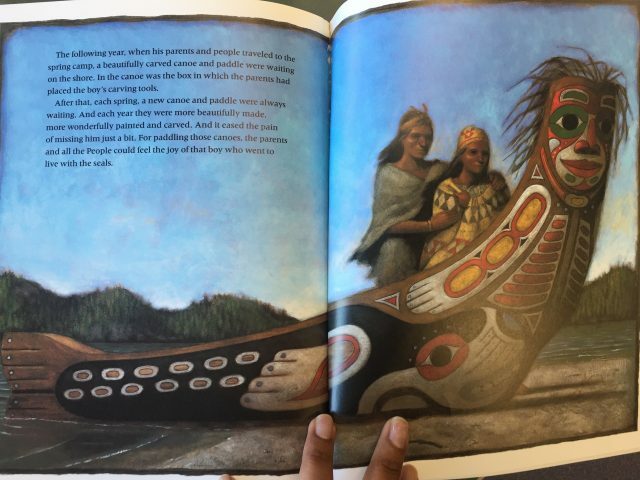 While the Author’s authority could be argued, Rafe Martin has published other myths retold in a way that has been welcomed by different communities, that being said, his authority on Native stories could be challenged. 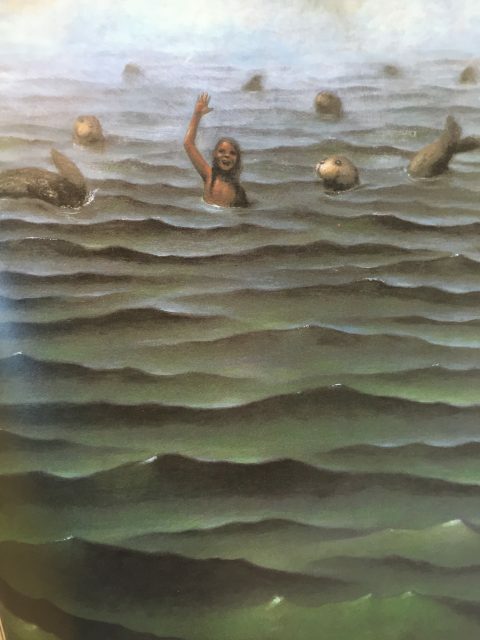 I would love to use a story of this nature in my Social Studies class to start a discussion about anthropology and embedding within a community, citing real life examples of Stanley Livingston and so on. Also posing questions about family structures and in what ways it can be difficult to go against the norm and find your own place in the world. This reminds me that my students are not blank slates, they come with a world of knowledge, some may be able to relate closely to this story, either through adoption from another culture, or foster care. Developing a discussion in a open and supportive atmosphere would be my biggest goal. Great post!! Thank you so much for walking us through the story. I loved your great use of image. It sure is a beautiful book! And you’re right- there is great potential for using this story with an anthropological mindset. I like the idea of opening discussion to the idea of embedding oneself in a culture. That could certainly be a good, deep discussion! I love this! The art really does look fantastic. 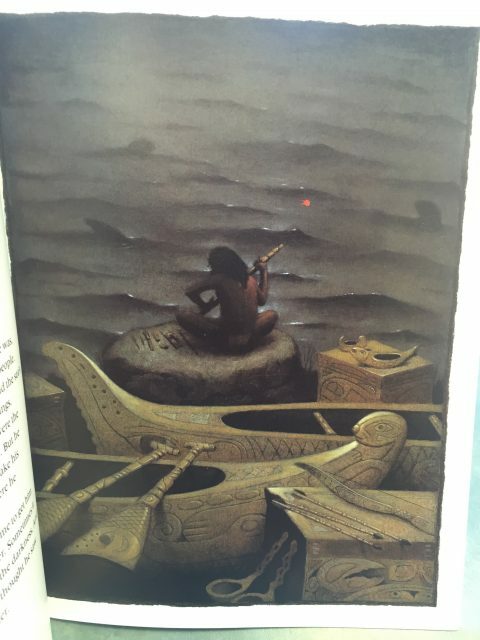 I agree, I think it could be a great tool to talk about this culture but also any other culture that relies on canoes or has a close relationship with animals that live in the ocean. Stories are awesome. I feel I just read my bedtime story for the night. Some thoughts before night-night time: it is kind of magical to see archetypal characters across cultures separated through time and space. It also evokes a sense of an Autistic spectrum in the character. That is all for now. Thanks for being the bedtime post. Goodnight! I can see story this as a spark to a larger conversation about anthropology and I’d be interested in seeing that play out in your social studies class. 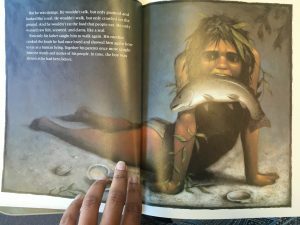 I’m still hesitant about the idea of picture books in high school classrooms, mostly because I can already picture the students groaning and tuning out when they find out they’re about to be read to. But if you can get them past that initial reaction and engage them in a relevant dialogue, then I can see the value of using this book in a lesson. I loved this book, and I almost used it in my post. I’m glad I didn’t, because you did a much better job of describing it than I would have. What stands out about this book, to me, is just how beautifully told and moving the story is. 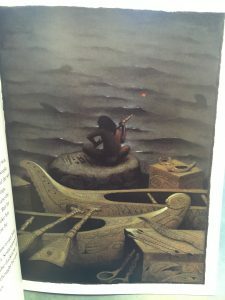 Sometimes these written retellings seem to miss what makes the story so powerful, and while I don’t know how authentic this version of the story is from a traditional standpoint, it has a force and emotion to it that I think shows real respect for the storytelling culture it comes from.